The book is out. 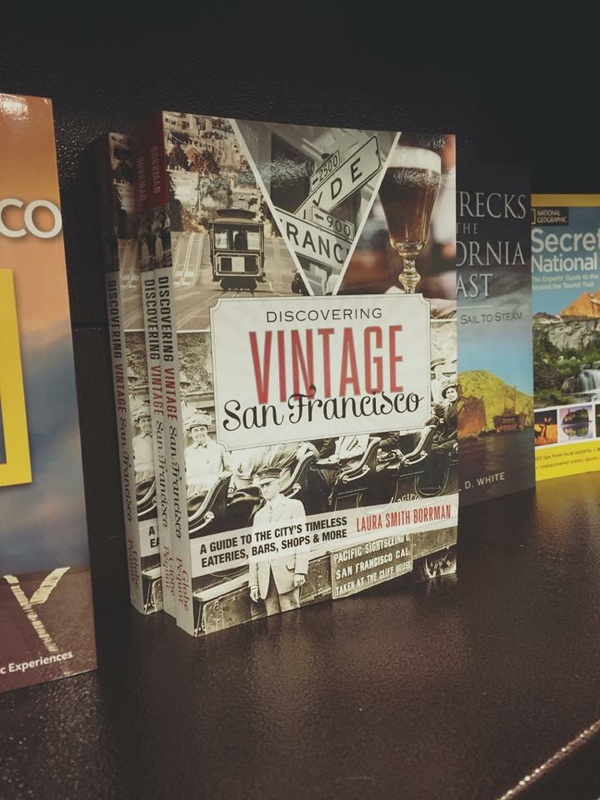 Discovering Vintage San Francisco is my second book, and seeing it in its finished, touchable form is exhilarating, unbelievable, surreal. And it’s out there, in public, all on its own now, just waiting to be discovered. It’s strange to see one’s book out in the wild. In the wild of the shelves of my local Barnes and Noble, to be precise. Facing front. Proudly, unabashedly, ready for purchase by anyone. I see it and think about all of its imperfections – I should’ve said this another way or pushed for a different photograph once we learned they’d all be in black and white – and everything that was left behind. All of the stories that didn’t make the cut, all the quotes that had to be excised, all the photographs for which there was no room. When an author sees one’s book – this author, at least – she sees it warts and all. As both an object of pride and accomplishment and a testament to the concept of continuous improvement. But what she sees most is what it represents – the people whose stories are contained in its pages. And she really wants it to sell. So, my one request to you, kind readers who may be looking at this blog: Buy my book, please. It’s available everywhere – big bookstores, little bookstores, brick and mortars and online – Amazon, of course – so it shouldn’t be too difficult to find. When you do so, you’re not only supporting me, the author, but you’re also signaling to the wonderful businesses featured in its pages that you care. You’re getting the word out about them, their longevity, their staying power, the brilliant character they bring to the city of San Francisco – and you just may be helping them stick around. Plus, you’re getting a really great guide to some of the coolest places in the city. The ones with gravitas. The ones with gray hair. The ones that go back decades, even centuries. The ones that have made the city what it is today, provided the foundation for all the pop-up shops and dinner clubs, hippest modern bars, trendy boutiques, temporary and Michelin-starred restaurants, everything on Bon Appetit’s latest hot list. These are the spots that came first. And knowing about them, giving them your business and being able to recommend them to your friends will make you cooler too. One last request: If you buy it, and like it, spread the word. Tweet about it, Facebook it, Instagram a favorite photo from it (or your own shot from its featured businesses), have a conversation with a person, in person, about it. Help it sell, and help these awesome legacy spots in the city by the bay persist through the ages. Next Next post: To Haberdashery!